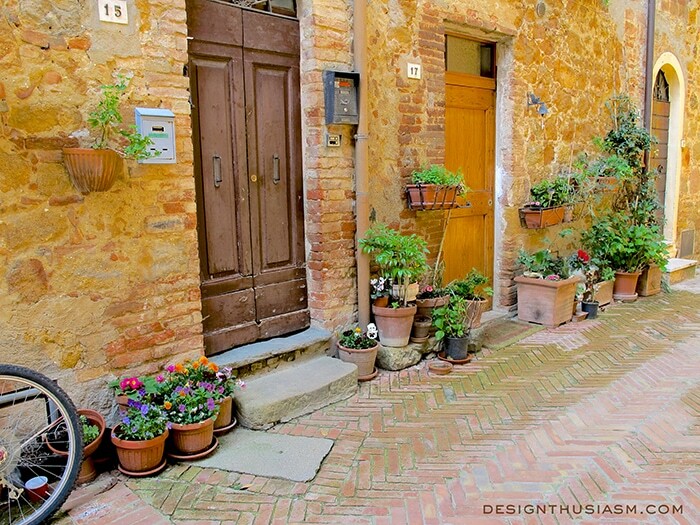 One of the loveliest towns in the Val d’Orcia, tucked into the Tuscan countryside, is Pienza. 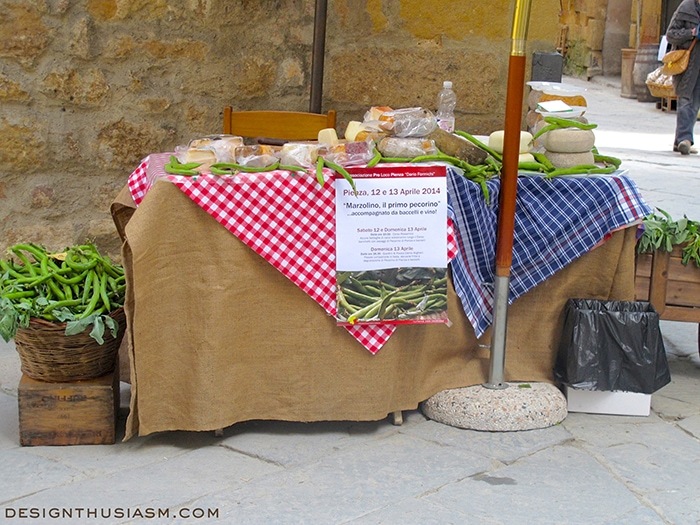 A hilltop town reached via a gorgeous drive through the gently rolling hills south of Siena, the thing that struck me most about the village was the abundance of sweet potted plants placed lovingly about. The views into the surrounding Val d’Orcia are outstanding. 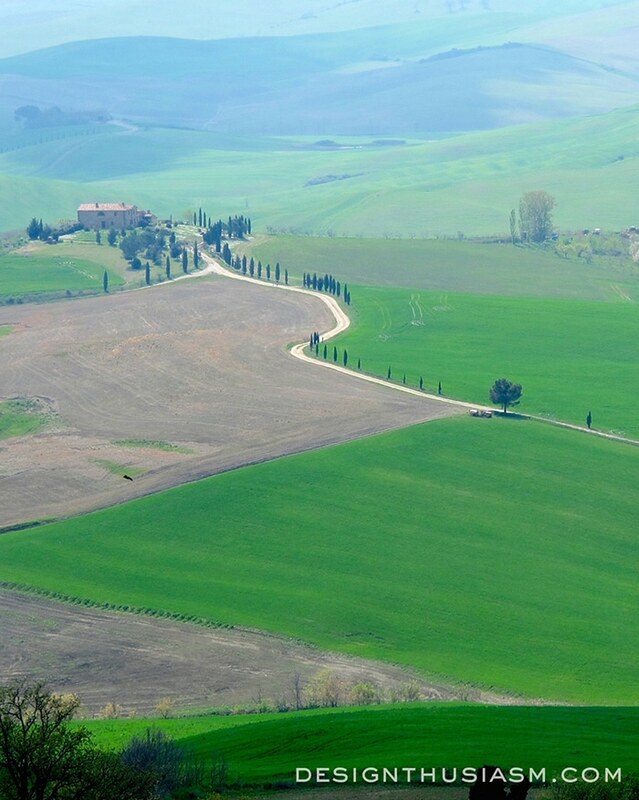 The road to Pienza meanders through the impeccably cultivated gentle hills of the Val d’Orcia. 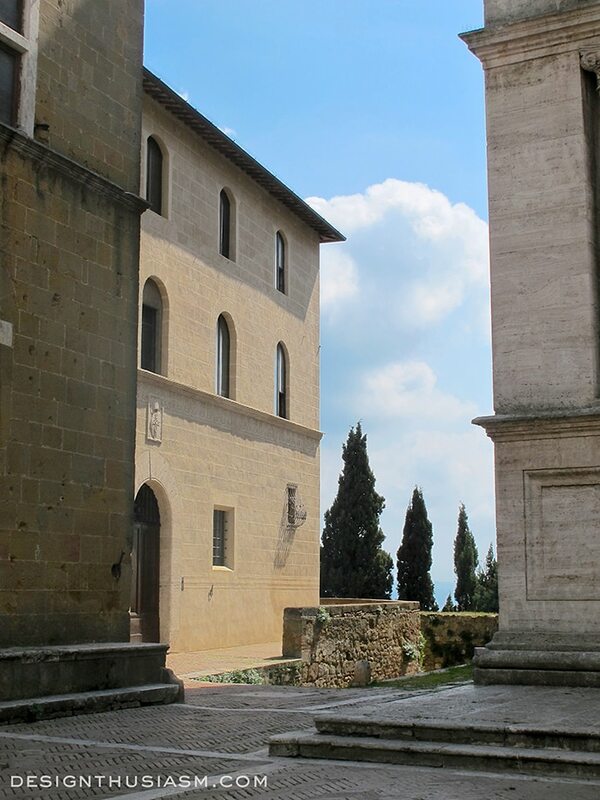 A view from the piazza reveals the luscious blue skies. 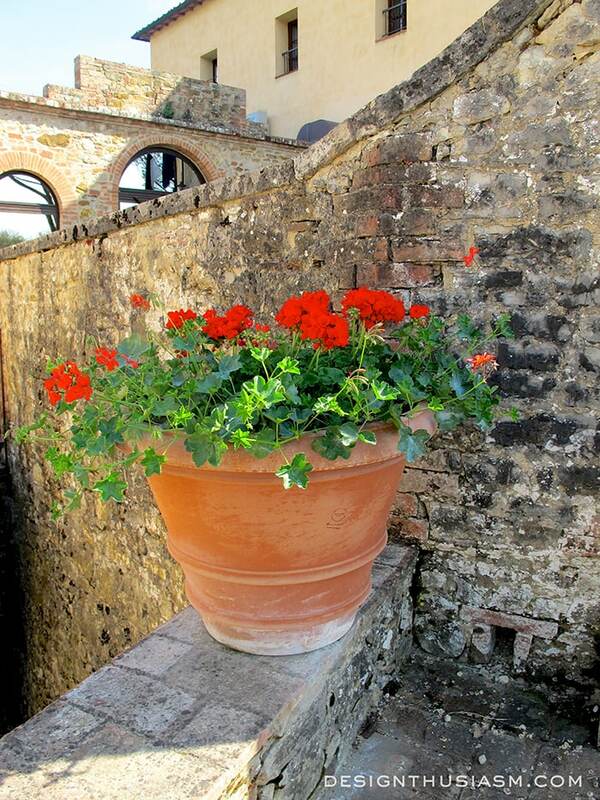 Potted plants are everywhere in this charming village. Yet color can also be found in the wisteria above. 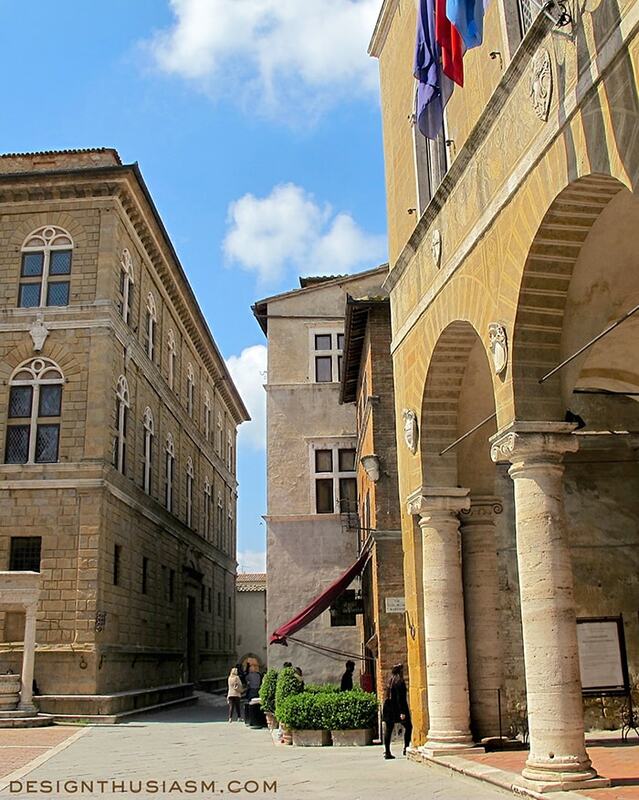 Rebuilt in the 15th century as an ideal Renaissance town, the main piazza is flanked by Pienza’s significant structures, including the columned Palazzo Comunale and the Palazzo Piccolomini. 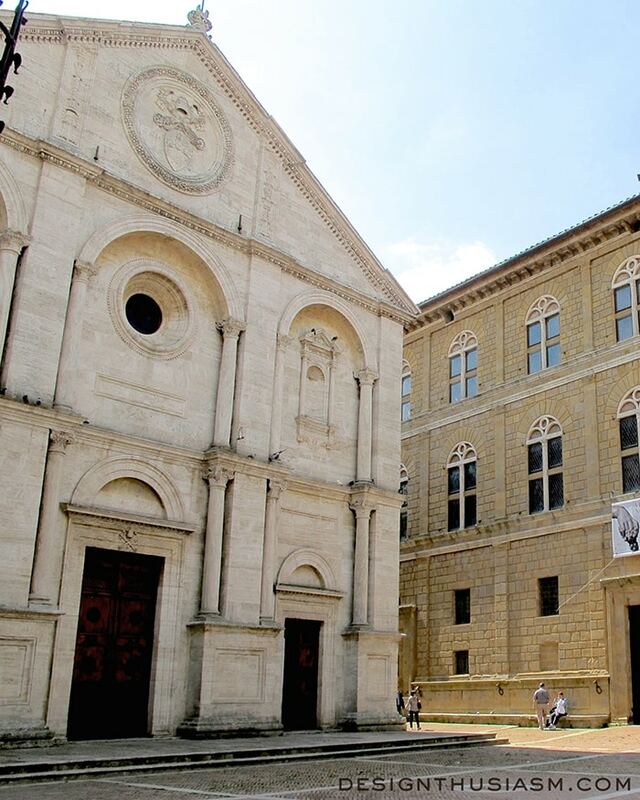 Pienza’s Duomo dominates the center of the piazza. The town is widely known for the best pecorino cheese in Italy. Flowering plants add to the colorful flavor. The simple stone facades are punctuated by lovely arched doorways and floral displays from floor to sky. For me, this is what sets it apart from the many lovely hill towns nearby. Gorgeous photos, you must have had a wonderful time. Looks a wonderful place. 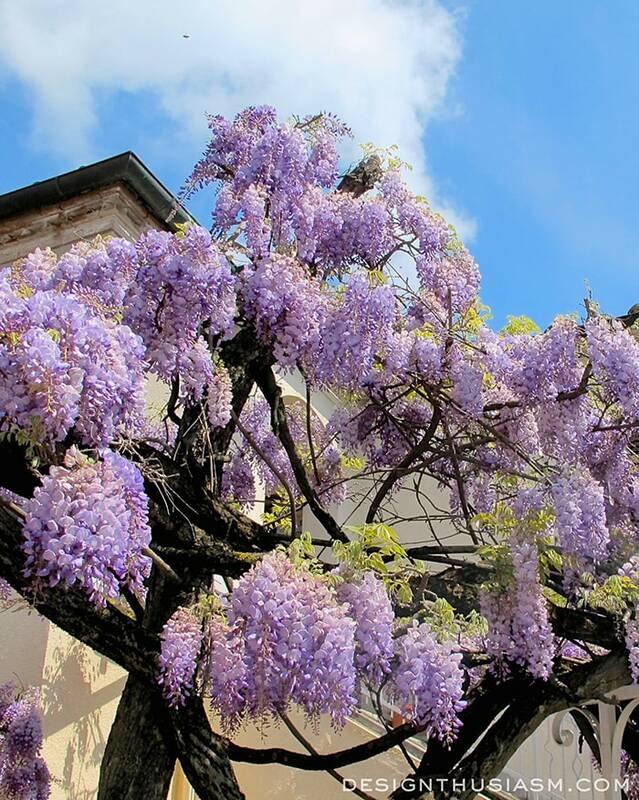 Beautiful wisteria. Beautiful pictures, Lori. 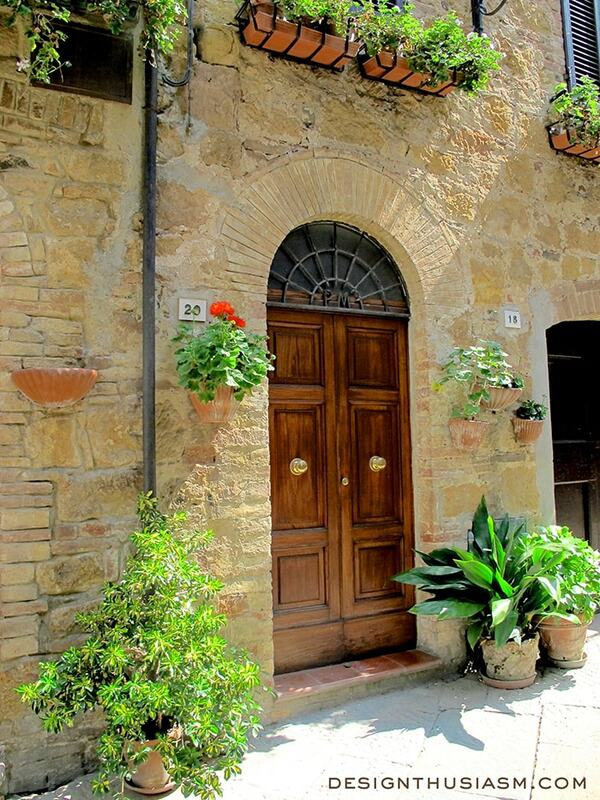 I’ve never been in Tuscany, but it on my list. So totally charming! It reminds me a little of San Miguel de Allende in Mexico where there are so many colorful wooden doors, flowers and greenery~pinning the last photo to use for painting inspiration, thanks! I love the studies and details that you are showing us today especially that gorgeous Jackaranda tree, love those amazing colors. Thanks for connecting on my blog. Stopping over from the comments you left on my blog! What a great blog you have as well. I like to mix design and travel as well. I’ve never been to Tuscany yet but I want to go. I’ve been all over Italy but this is a part that I need to see! Thank you so much Brittany! Yes, I too like to find the travel/design mix… 🙂 Tuscany was a late add for us, as well. We were visiting my daughter who was studying in Florence, so it was a natural stop. In the past we’ve done mostly the cities or the coast, so this was a nice change. So very relaxing actually! I was so amazed at how the whole town looked like one big gardening adventure! All lovely photos but especially love the very first one–looks so warm and cozy. What a charming place. Oh my ! What beautiful photos, I love your blog – its so colorful and inspiring! 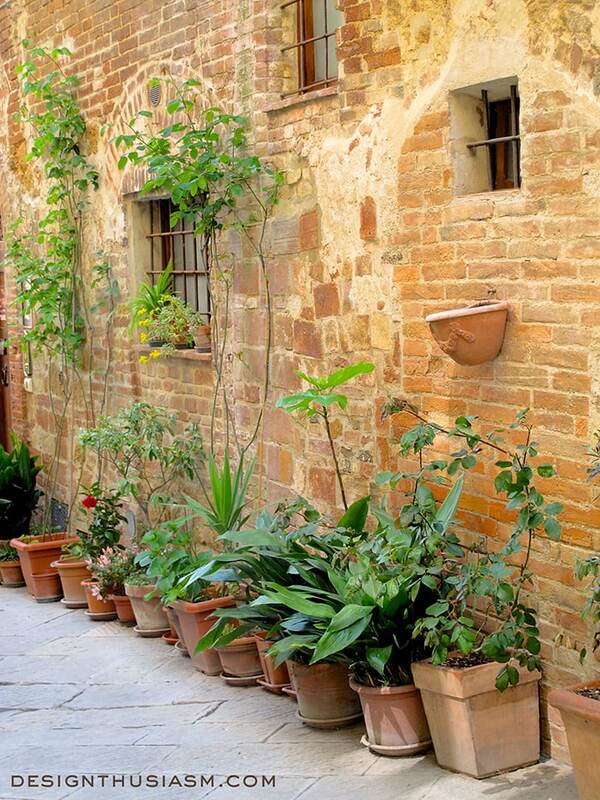 Those are lovely potted plants, especially the window boxes. 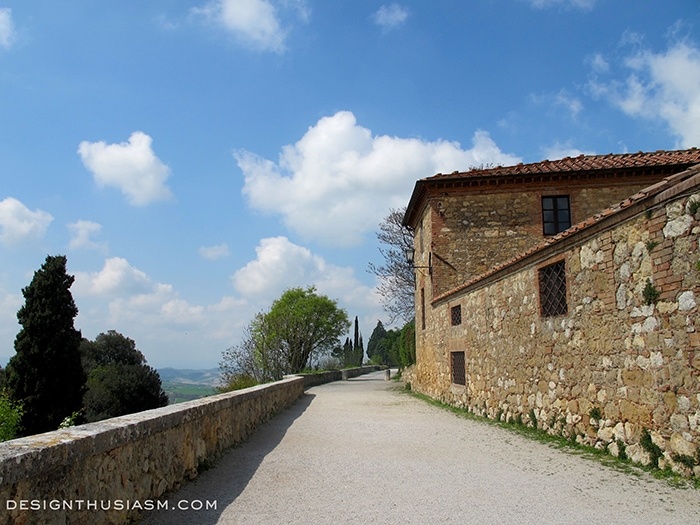 I didn’t have a chance to visit Tuscany the last time we were in Italy, so I am enjoying it through your photos. The umbres and ochres of the buildings and the gorgeous view of the valley are just as I pictured it would be. That wild burst of wisteria, though, really surprised me. I was there four years back just for few hrs and I loved the place. It has a charm of its own! Thanks for taking me there again! Wonderful, but Italy is just so overwhelmingly pretty. Indeed. Between Italy and France we keep returning to see more. Next year, hope to try something new… Greece. Thanks for visiting! Yes, that whole region is so lovely! Thanks and lol! Most definitely was there… 😉 Thanks for visiting!! Lory, I have just discovered your website and am just thrilled! I love tablescapes, and yours are outstanding! My husband and I are traveling to Italy in October, and I have just found your beautiful pictures of your travels there. Breathtaking! If this isn’t too personal, what camera did you use to take your pictures? They are magnificent. Welcome to Designthusiasm, Martha! And thanks so much for the kind words… 🙂 How lucky that you’ll be traveling to Italy, one of my favorite countries!! The camera I used for my travels thus far is a Canon G12. It’s a wonderful camera for travel because it’s very light and can be used on automatic for capturing quick shots. It’s also the camera I used for the first 1 1/2 years on the blog. I’ve only recently upgraded to a Canon 6D. I bought the 6D to use only in the house because it’s quite heavy, but I love the photo quality so much, I’m not sure what I’ll do next time I travel. But the G12 really is wonderful in a pinch. Enjoy! !